I am still trying to figure out this new website creation thing. I'm wondering if the word 'debacle' might be used to describe my achievements so far? I honestly don't know, but what I can say for sure is that it is an extremely annoying trying to create this damn thing and I'll admit to wanting to chuck the computer right into the garbage on more than a few occasions. And on top of that, I've been wondering about the demise of my cooking skills lately. 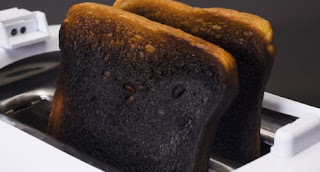 I lately seemed to have inherited the burnt gene in the kitchen. I swear that everything I ve touched or cooked his past month has turned to crap. Besides typical toast one makes for breakfast, I've also cremated: cobs of corn on the bbq, chicken bones for stock, bacon(!) - that incident really made me cry, and more recently, a burger I was frying for dinner. Ground chuck, lovingly fashioned by my own two hands into a tasty burger, charred to smithereens. It resembled, well, I won't share what I think it resembled suffice to say it wasn't pretty. Oh drama, one can never see enough of you when you're stuck in the personal and creative doldrums. That last disaster for me released a genuine "what the f*ck is going on here"? moment , or should I say 'moments'. So many cooking failures do not lend itself well to culinary confidence. Yet, I try to relax in the face of failure, knowing that my disasters won't last long and actually puts me in very good cooking company. Plenty of chefs and cooks have failed, and I am no different. I think. I hope? So where does a fresh start come from these aforementioned culinary and computer disasters? I have still decided to go forward with my new website and image makeover simply because I can and should. Of course it helps having amazing, personal support to see you through the rough times, and trust me, I'm very, very lucky I have that. When the website launch happens, no matter what, I'll be proud that I got to that point of closure. And I'll add that closure will also include a proud display a perfectly cooked, non-burnt item, to place on my front page.